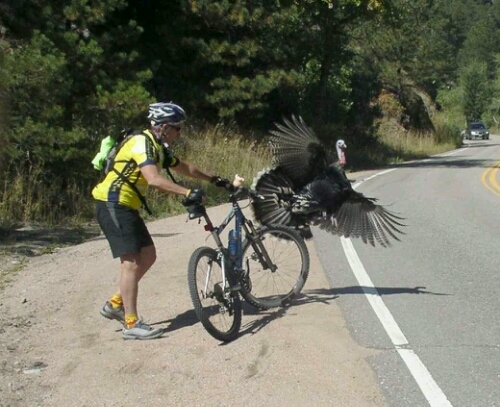 The Destination America channel treated us to some strange, tongue-in-cheek fare the evening before Thanksgiving with a special styled somewhat like numerous others airing on that network, and called “When Turkeys Attack!” The show used home video footage depicting wild turkeys chasing children, grandmothers, and grown men; one chased and kept up with a bicyclist for a short distance, while others attacked mail delivery vehicles in a territorial frenzy. Now wild turkeys should be distinguished from domesticated turkeys genetically engineered to be walking hunks of meat; these are the descendants of theropods, a carnivorous dinosaur. A wild tom turkey can stand about waist high on a human, and can drop kick you in the head. This could be a bad encounter as the males have razor sharp spurs on the back of their legs that are 1-1/2″ – 2″ long. They can flog you with their wings. Turkeys will try to strike at your head, have acute hearing, and can read subtle behavior rather well. People who seek to lure birds can sometimes get too much of a good thing…or so seems to be the underlying message of a recent Verizon commercial, More Birds. “There’s good more, and there’s not so good more,” intones the announcer. Hubby is outside while the wife is inside, plinking away on a computer tablet and happy that she’s accumulating Verizon bonus rewards points. “Honey, look! I got one to light on me!,” babbles the guy to his largely-oblivious wife as a small bird lands on his extended arm. “Uh huh,” notes the wife. “You’ve got a buddy!,” says the guy as a second bird lands on his other extended arm. 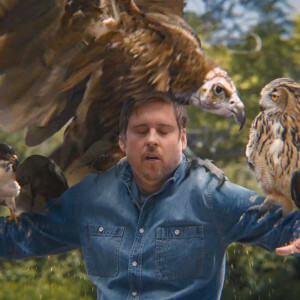 While the woman continues to be completely involved with her Verizon bonus rewards points, birds continue to land on the man’s extended arms. “I’m like a statue!,” he intones, not wishing to scare them away. Trouble is, the birds continue to come, including an owl; things are getting out of hand. The last bird to come appears to be a large bird of prey, and it grabs the guy from behind, literally carrying him away with his work. The woman either doesn’t notice, or perhaps doesn’t care. Familiarity breeds contempt, after all. Tags: birds lighting, Verizon's "More Birds"
West Virginia continues to be a hotbed of unknown species with the Snallygaster (S2/Ep11, 2014), said to be a huge, flying reptile with a twenty-foot wingspan that weighs in at about 800 pounds. First seen in the mid-1700’s, the Snallygaster was known to German immigrants. Multiple sightings occurred in more recent times in the 1990’s. The Mountain Monsters team first interviewed an eyewitness, “Bub,” a trapper whose coyote traps were being robbed of their catch and ripped from the ground. “Bub” reported hearing a loud screech and beholding something about 7′ tall with a beak. Their first night’s investigation followed, with area coyotes appearing stirred up and parts of “Bub’s” traps found. Noises were heard up high, and fearing aerial attack the team took refuge under logs, vacating the scene thereafter. A second eyewitness, “Ty,” was interviewed the following day. This squirrel hunter reported that one of his dogs was slain by something unknown, finding the animal dead with a puncture wound. He had set up a trail camera, sharing two images which seemed to show something on the ground with wings. A third eyewitness, “Mark,” a farmer, reported hearing coyotes fighting with the creature near his farm. Remarkably, “Mark” also presented a large fractured egg, said to be one of the Snallygaster’s. Speculated then was a scenario where the coyotes had stolen the eggs of the Snallygaster, causing it to essentially go to war with coyote-kind. The coyotes needed a champion, and Wile E. Coyote was nowhere to be seen. – – “Things that fly” might have been considered the unifying theme of a recent Monsters & Mysteries in America episode, one in which the segments again considered content previously aired on such shows as MonsterQuest, with Batsquatch essentially a rehash of a segment already done by Monsters & Mysteries itself. Now Flying Humanoids have been reported dozens of times, both from across the United States and elsewhere. The occurrences reported on here, however, transpired in the Ozark Mountains of Missouri in Turkey Creek. Two bothers reported that in July of 1998, they had been looking for “a bit of adventure” when an unknown flying fiend was powerful enough to lift their vehicle slightly off the ground and shake it. The humanoid is reported to be tall and hairless, having red eyes and a great wingspan. Brothers Ed and Danny Overton reported that a humanoid flew at their car, causing it to go into a tree. Dan Overton returned to the Turkey Creek area in 2010, where he observed a freshly-dug cave, and heard the growl and sound of something large coming through the woods. Drag mark scrapes were seen, and tree limbs were broken and dropped around them. The humanoid was reportedly seen and pursued, but took off and subsequently disappeared. The Jersey Devil is a classic cryptid native to the Pine Barrens of southern New Jersey with a back story going to 1735 when a Mother Leeds gave birth to an unwanted 13th child and cursed it, wishing for it to be a devil. Be careful what you wish for, as they say, for Mother Leeds reportedly birthed something with the head of a horse, red eyes, and the wings of a bat that grew to be about the size of a small elephant. Considerable hysteria over the creature was reported in 1909, and in more recent times times Paul Pedersen Jr. encountered the devil as a child in 1963 while babysitting his sister at home. Hearing something hopping up the cellar steps, young Pedersen and his sister ran to the front yard to await the return of their father, who found the basement trashed, and removed a coal chute through which it was figured something had gained access to the house. Even more recently in 2008 a woman and her boyfriend while in a car heard screeches and the flapping of wings. Something then hit the top of their car, which was dented as a result. …and darned if I don’t have an incredible desire to eat some Doritos right now, although I prefer the ranch flavor…ranch, Mmm! – – “Get in the bag!- – Get in the bag!,” cries the Denskies’ Dad, a would-be turkey pursuer to an agitated and very mobile turkey, which readily keeps ahead of the hapless hunter. So intent is Mr. Denskie at bagging the bird that he is oblivious to a number of trees looming in the immediate vicinity, soon colliding with one of the massive trunks and getting knocked out cold. The turkey escapes, none the worse for the wear. – – So who’s the real bird brain here?! We haven’t seen a hunter this inept since Elmer Fudd, and Sears is bringing us this reminder of their Black Friday sales as a better way to save money than hunting your own wild turkey, most of which bear little relationship anymore to what’s being sold in supermarkets…and a happy holiday to all of you! – – The latest Geico commercial is a hoot! Now everyone knows that 15 minutes with Geico can save you 15% or more on car insurance, but “did you know that some owls aren’t that wise?,” asks one woman on the road to her male car companion. The scene then shifts to the woods at night, where a female owl is reminding her mate that she’s having brunch with Megan tomorrow. “Who?,” responds the male owl. “Megan, my co-worker,” clarifies the female owl. “Who?,” again calls the male owl. “Seriously, you’ve met her like three times!,” adds the female owl. “Who?,” replies the male once again. At that point, it’s time for an exasperated sigh from the female owl as her head turns away…I’m sure that many of us guys have experienced this kind of thing, but honestly, we’re not all clueless!